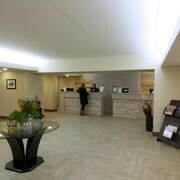 Where to find Stayner hotels near an airport? 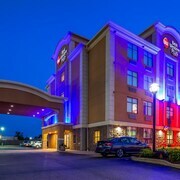 Where can I find hotels in Stayner that are near tourist attractions? Arranging a trip to Stayner? Looking for some great accommodation options? Within a convenient 0.1-kilometre (0.06-mile) radius of Stayner's center visitors can select from 11 Expedia-listed places to stay. Expedia-listed hotels that are within driving distance of Stayner include the The Donato House Hotel and Riverview Lodge. 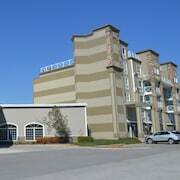 20 kilometres (12 miles) away from downtown Stayner, is the Westin Trillium House, Blue Mountain. The Mountain Springs Resort is situated 20 kilometres (13 miles) away. Some other accommodation options worth looking into include the Living Water Resort and the Embarc Blue Mountain. The greater Southern Ontario region is definitely worth seeing as well. Southern Ontario boasts beaches. Popular Southern Ontario tourist sites are traditional villages. In this region of Canada visitors can also enjoy skiing. Consider spending a day or two discovering Georgian College and Snow Valley Ski Resort, in Barrie, 30 kilometres (20 miles) to the east of Stayner. 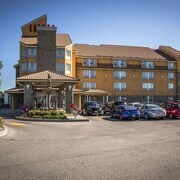 Should you wish to visit Barrie, check out the room rates at the Hampton Inn & Suites Barrie and Holiday Inn Barrie Hotel & Conference Centre. 40 kilometres (24 miles) to the northeast of Stayner, you'll also find Midland, home to the Best Western Highland Inn & Conference Centre and Comfort Inn Midland. While visiting Midland, set aside a little time to visit the Bamboo Spa and Midland Golf and Country Club. Consider spending an afternoon cheering along with fellow sports fans at a local game. You'll find Woodbine Racetrack 85 kilometres (54 miles) to the southeast of Stayner. For visitors who are interested in sleeping close by, make a reservation in the Sheraton Gateway Hotel In Toronto International Airport or Residence Inn by Marriott Toronto Airport. If you are traveling into or out of Pearson International Airport and would like to stay nearby try Homewood Suites by Hilton Toronto Airport Corporate Centre or Residence Inn by Marriott Mississauga - Arpt Corp Ctr West. 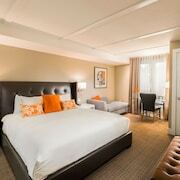 What are the most popular Stayner hotels? Are there hotels in other cities near Stayner? 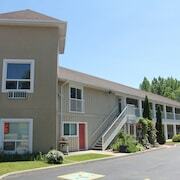 What other types of accommodations are available in Stayner? Explore Stayner with Expedia.ca’s Travel Guides to find the best flights, cars, holiday packages and more!